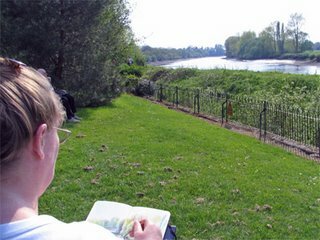 MAKING A MARK: Plein Air Sketching at Kew 04.05.06. First, check yesterday's date - did anybody else spot it? I didn't until this morning when I was downloading all my photos to the computer. "He who must not be bored while I sketch" had a day off yesterday and decreed we were going out. Fortunately it was the first splendid day we've have this year. Hot - but not too hot - and sunny with a light breeze all day. We decided we'd go down the District Line to Kew Gardens - for more walking and sketching. One of the things to see at Kew right now are bluebells around Queen Charlotte's Cottage - and they're three weeks late just like the ones at Emmetts last Saturday (see Sketching Bluebells). I found a man with a very large camera on a tripod and discovered he was filming them for the third series of the BBC programme "A Year at Kew" - and that was how I found out that they were three weeks late - as that was how long he had been waiting to film them! 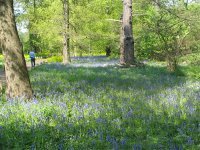 Other things to see right now are the magnolias, the rhododendrons and azaleas to the right of Syon Vista and the lilacs near the Orangery. Everything is late though. The real blaze of colour was in the beds next to the Palm House. 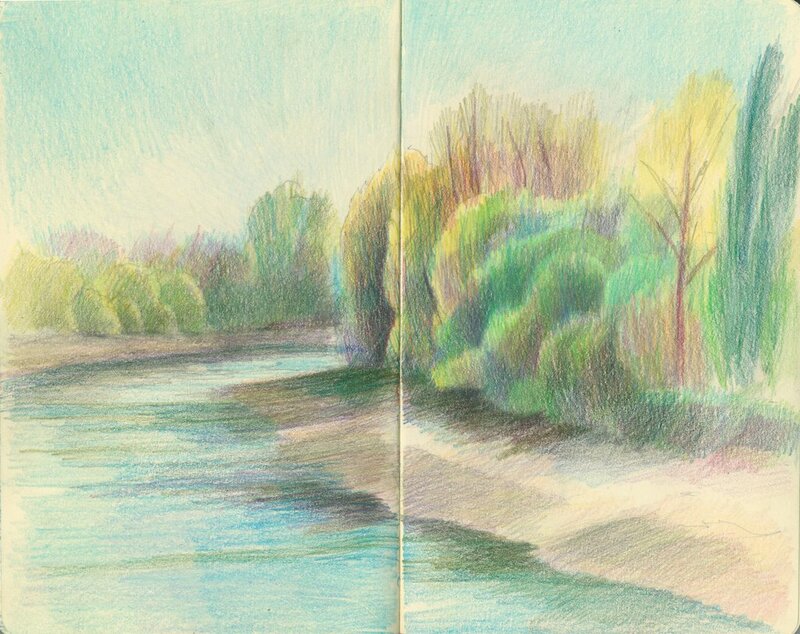 I did two sketches using coloured pencils in my Moleskine. The first - of the Waterlily Pond - is IMO not a success. 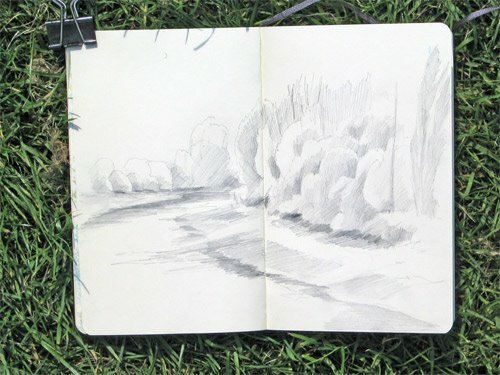 It has very little graphite underneath - which, on reflection was a bit of a mistake as it was a very complicated view and would have benefited from taking it a bit more slowly at the graphite stage. The colours are also [expletive deleted] difficult. The darks were very challenging and and I think I need to work more on trying to get the very peculiar colour of new lily pads - which appeared to me to be a very light olive green on top of a crimson base, producing a soft russet shade - but with great depth. 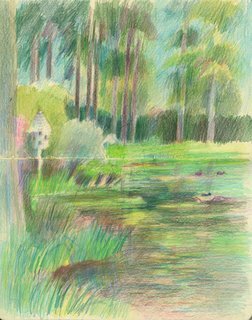 We watched all the moorhens and coots busying themselves with nesting activities -they had nest built out right in the middle of the pond - so naturally they had to go in the drawing as well. We also very fortunate while at the pond to see a golden pheasant - whose colours are simply stunning. the photo of the graphite sketch taken before I started to use the coloured pencils. 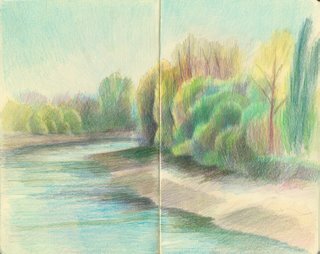 finally, the colour sketch of what it looks like with the first flush of new growth of the trees after the coloured pencils have been added. two pencil cases - I sort the blues / greens and darks into one and the reds / yellows and lights into the other - makes finding a pencil much simpler. Also the cases tend to have mostly the short stubby pencils with just a few longer ones of the colours I expect to use that day. a plastic tray (I think this one was from the purple sprouting calabrese we had at the weekend!) into which I put the colours I am using. I drop new colours into this as I pick them out (rather than back into the pencil case so I forget which colour I used already and avoid having to add it to the vast number already clutched in my left hand!). Incidentally, for those people living in or near Kew who'd like to sketch or paint in the gardens, I think I spotted four other artists there yesterday - mainly focusing on the blossom and the bluebells. Absolutely one of my most favourite places in the world. I used to sketch there regularly when I was a student. It used to cost ten pence to get in then! I always seem to miss the best of the rhodedendrons - for some reason. Lovely drawings. Thanks Julie - I forgot to say we walked almost all round the gardens - I'm sure we must have done at least a mile re. your challenge! I well remember those 10 pence days as well!.... I've now become a Friend so I can go as many times as I want. In fact, I'm heading back next week for the Artist's Kew exhibition. Thank you for showing us how you work! I love the idea of dropping the colors into a tray as you work...simple, but I never thought of that! You have a beautiful sketching style. What a lovely place to draw. I'm sure your DH has plenty to look at. Thanks for such a detailed post on your travel kit. Its always fun to see what everyone else uses. I like the light touch you use for your pencil drawings. Exquisite, Katherine. And I do so appreciate seeing your point of view shot as well as the finished drawing. It is fascinating to see how an artist interprets her subject. You have an absolutely wonderful blog here, and I loved your gallery as well. 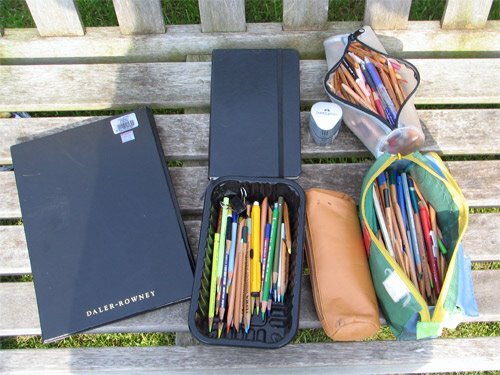 Thanks you for sharing so much with your fellow painters, even those across the duck pond! how wonderful to live there and visit this beautiful garden. like Karen said it's nice to see your view and what you sketched. i saw some flowers growing in the woods near my house that remind me of blue bells. I'll have to get a picture and go sketch them then try and find out what they are. the colors in all these are wonderful, so bright and glowing, I'm really enjoying these daily walk sketches, as always your sketchbook pages are beautiful!